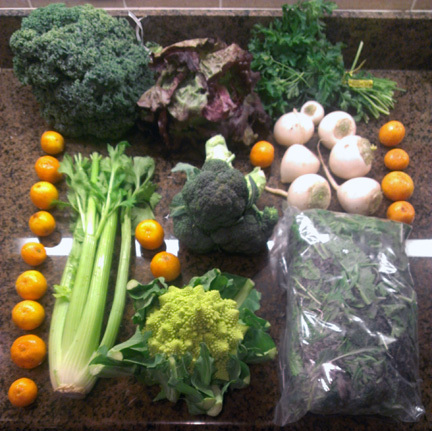 Last week, we received a CSA box from Greenhearts Family Farm (as the title suggests). What’s a CSA box? CSA stands for Community Supported Agriculture. The contents of the box are organic, local fruits and veggies. I had been thinking about getting one for a long time now, but just never pulled the trigger. After doing some research and finding that this farm had five stars on Yelp, and the picked the stuff on Monday/Tuesday and deliver it on Thursday/Friday, it was time to get one. I don’t think I’ve ever had the opportunity to eat something so fresh, other than stuff my relatives and friends grow in their backyards. Now before you start thinking I’m some fancy person, let me assure you I’m not. I am, however, a lazy person and I really love supporting local businesses. I do apologize for having such crappy pictures, but I promise the next post of pictures will be much better. Here’s what I received in my first box: 16 pixie tangeries, 1 really large bunch of curly kale, 1 red leaf lettuce, 1 large bunch of parsley, 1 bunch of celery, 3 crowns of broccoli, 1 romanesco broccoli, 7 white turnips and a bag of mixed greens. I ate most of the pixie tangeries because they were delicious (but really hard to peel, since they were so small, so I cut them into quarters). We started with the spring mix, assuming it would wilt the soonest. We tossed the mix with some olive oil, salt, pepper and used juice and chunks from the tangerines to make a dressing, added toasted sunflower seeds (which I dry toasted on the frying pan). 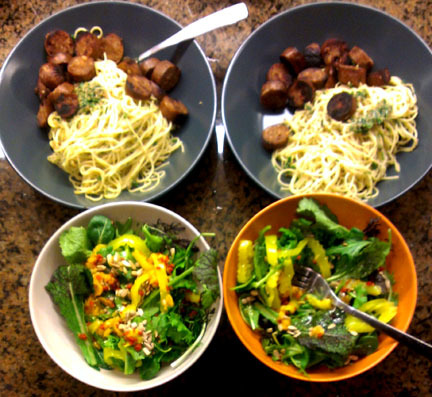 This was one of the most delicious, simple salads I’ve ever made. It needed nothing else. We also cooked up some pasta and tossed it with another quick concoction fried up in a pan consisting of: olive oil, minced garlic, chopped up parsley from the box. I also had some soy sausages, making this a vegan dinner. Here’s a recipe from something we did last night. I made a vegan version, but there is a non-vegan substitute in parenthesis. Romanesco broccoli – 1 head, cut up into little bite-sized pieces. Wash your romanesco and pull out all the leaves. Cut as you would any cauliflower and make sure you have little bite-sized pieces. 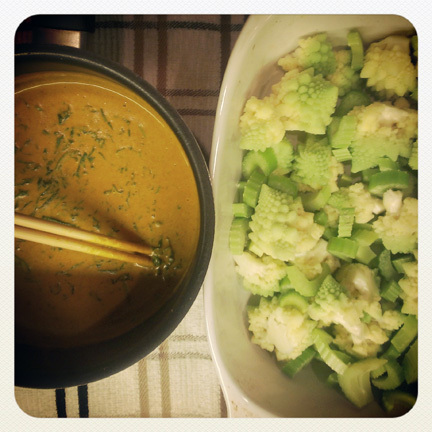 Boil a pot of water and drop the romanesco in it for about a minute or so (if you like it more al dente, which I do). Strain and let cool. In a small saucepan, drop all the sauce items (except for parsley) and stir until combined. After everything is mixed well, drop the parsley in and stir/cook until wilted, probably 10-20 secs. 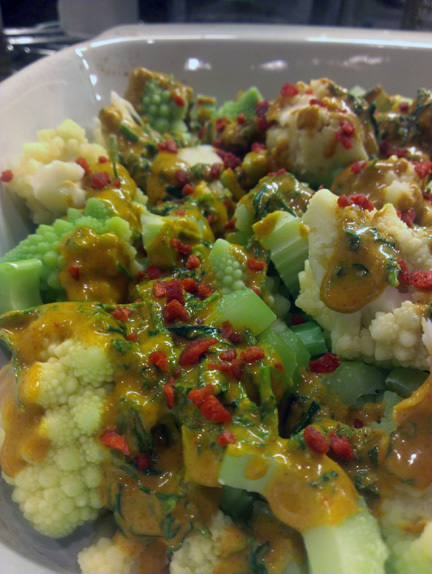 Place the celery and the romanesco in a baking dish. I used a ceramic, pretty tiny one, about 9″x9″, but any will do, as long as it fits (I’m sure glass will be fine). Mix them together evenly (feel free to add other veggies as you desire) and pour sauce evenly over veggies and drop the bacos (or tear pieces of pancetta/prosciutto) on top (feel free to add breadcrumbs or panko on top. We were going to, but we forgot due to hunger) and stick it in the oven.